I've had a subdomain at Uberi.Mesecons.net for a while now, but only recently got around to putting something in it. I will be posting new articles about advanced Mesecons design and construction breakdowns/techniques from time to time. Check it out! There is no commenting system in place; you can make comments here in this thread. 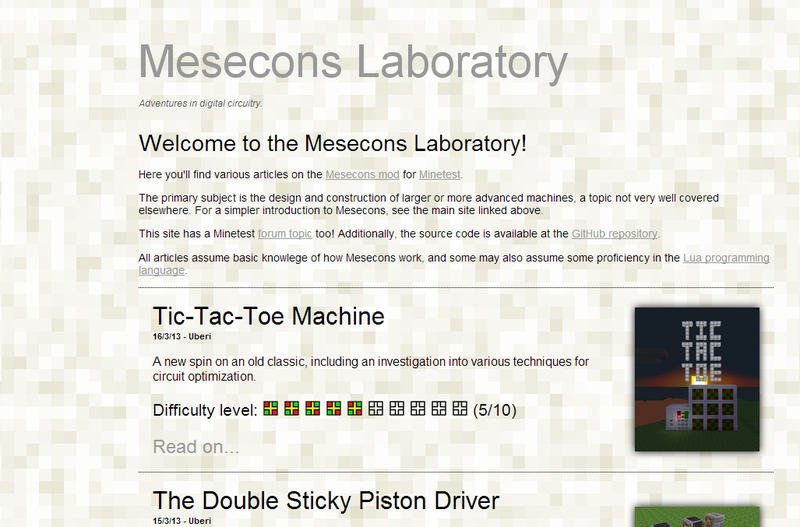 If you'd like to write an article for the Mesecons Laboratory, send me a message! Last edited by Temperest on Sun Mar 17, 2013 20:16, edited 1 time in total. Last edited by Nore on Sat Mar 16, 2013 11:14, edited 1 time in total. Admin pro tempore on 0gb.us:30000. Ask me if you have a problem, or just want help. This is a signature virus. Add me to your signature so that I can multiply. Now working on my own clone, Mosstest. I guess I'm back for some time. I built a 7-segment display where there is a button for each number (0-9) and when you press one of them, that number appears on the screen. It doesn't use any microcontrollers or luacontrollers, all it uses are insulated mesecons (plus the corners and T connections), light blocks, switches, mese blocks, and diodes. 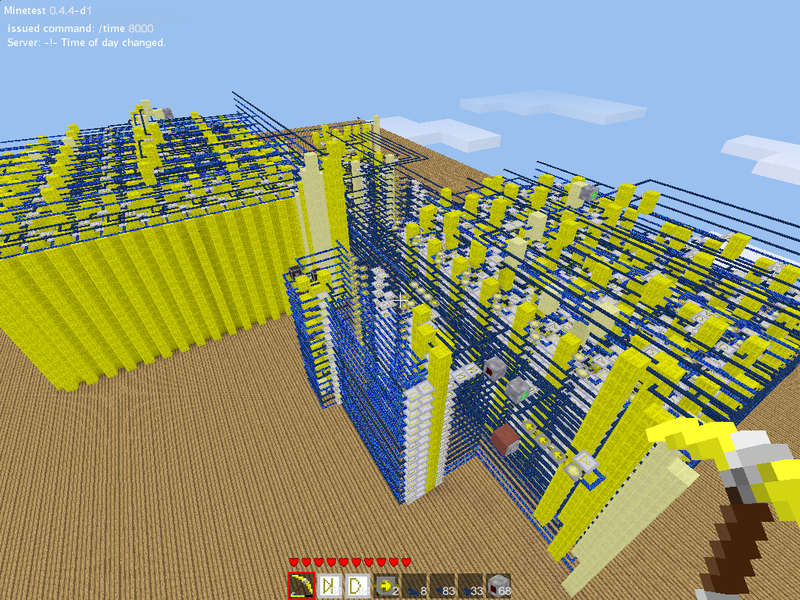 It uses a 16-bit architechture, with 256 ROM registers and 32 RAM registers. Oh, and don't expect it to really work unless you change delayers and button delay to something 100 times the normal one, and setting unused_block_timeout to something far larger (or use the force_load pull). The program in the computer should make the sum of the integers form 1 to 10, but I never saw it execute a single instruction. Nore: that would be awesome! If you do go about doing so (it seems like a lot of work), I will certainly add them to the site. By the way, what are its capabilities? What architecture is it using? From the map it seems like some sort of modified Harvard architecture. In any case flying through it feels like the towers scene from "The Matrix". 12Me21: I'm also looking for a "Back to the Basics" category, where we use only the core features such as wiring and diodes. That sounds like a perfect entry to have. My next entry will be about a Mesecons 3D printer! Stay tuned. Oops, you should disable overheat too. About its architechture, I made the one presented here: http://www.nand2tetris.org/course.php (no modifications except reducing RAM and ROM, and doing base components another way). 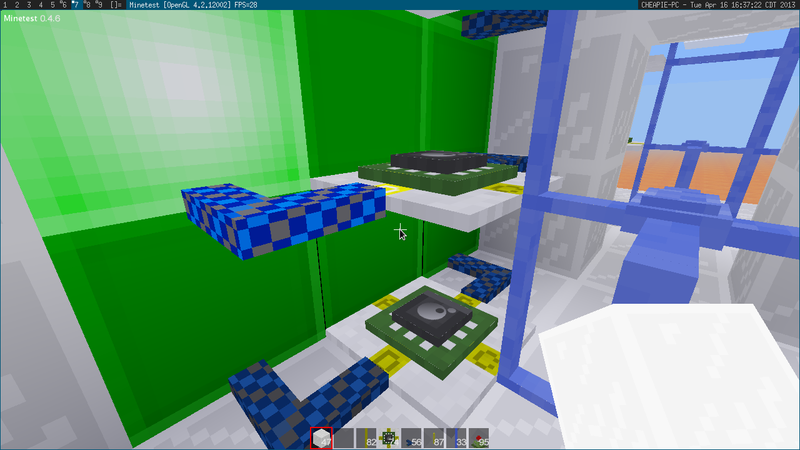 Another advantage is that every component can be reused in another creation because I built something modular (but it was long to connect everything to everything). A suggestion for the site: if possible, make seperate pages for each creation, and perhaps a search function. Nore: I will split them into pages, and maybe consider installing something like WordPress to deal with the content. As it is now, it is all hand coded HTML/CSS/JS, that's why the site loads so quickly. 12Me21 wrote: I built a 7-segment display where there is a button for each number (0-9) and when you press one of them, that number appears on the screen. It doesn't use any microcontrollers or luacontrollers, all it uses are insulated mesecons (plus the corners and T connections), light blocks, switches, mese blocks, and diodes. on a scale of 1 to 10 i am OVER 9000!!!!!!!!!!!!!!!! Articles split up into pages. Index has previews of each article. Difficulty levels for each article (scale of 1 to 10). There is a new picture in the first post, as well as updated links. Great! 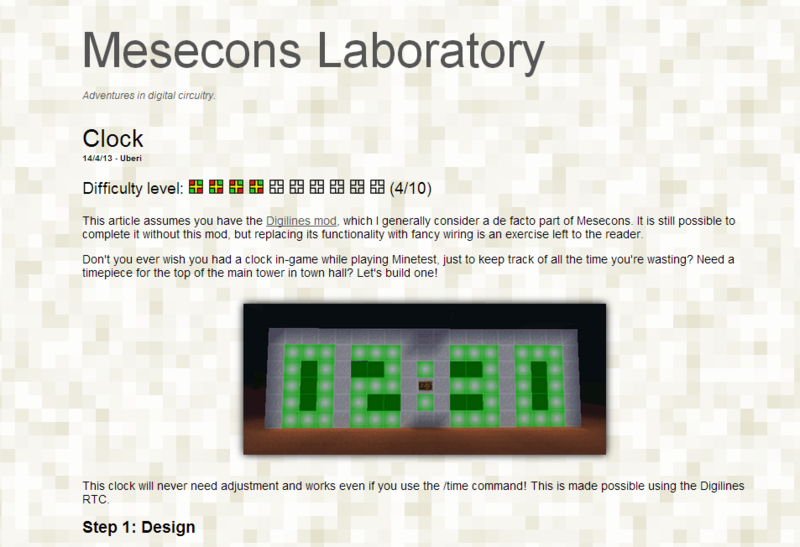 I will soon make a link to the laboratory from the main page. New article: the tic-tac-toe machine! A complete guide to building your own machine to play this classic game. The node detector is an important part of the mesecons 3D Scanner, the mesecons punch tape computer, and a lot of other more advanced machines. 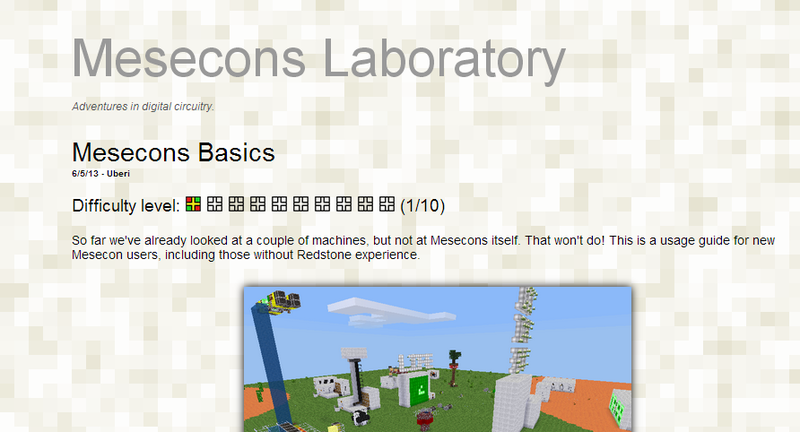 Check out the article at the Mesecons Laboratory for a detailed guide on how to design, build, and improve on it! I made an article for my site too: the multiplier, an improved version since the last competition. See it at [url]nore.mesecons.net[/url]. Thanks to have added a link to my site on yours! Excellent! 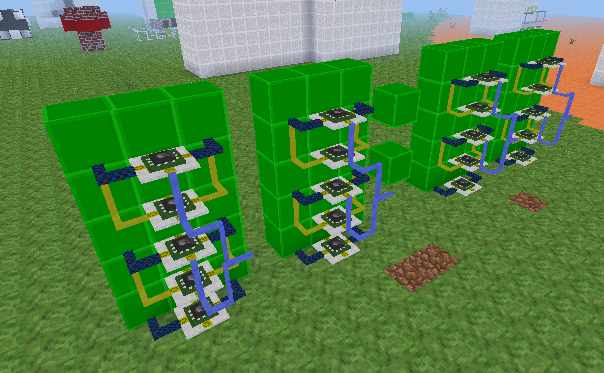 I tried to build a multiplier myself back when the only logic device was the plug/socket/inverter, but each adder being at least 4x5x4 made the whole thing prohibitively large - the main problem was making a compact XOR gate. Basic Mesecons is great for people looking to learn about the low-level digital stuff and the logic behind how things work. I like the way the article explains the reasoning behind most of the components built. The digital clock does exactly what you'd expect it to - it tells the time. This one also covers the creation of a very compact 7 segment display plus a built-in driver for the digits 0-9. Last edited by Temperest on Sun Apr 14, 2013 20:11, edited 1 time in total. I'm having trouble with it - some rows show garbage for certain digits. 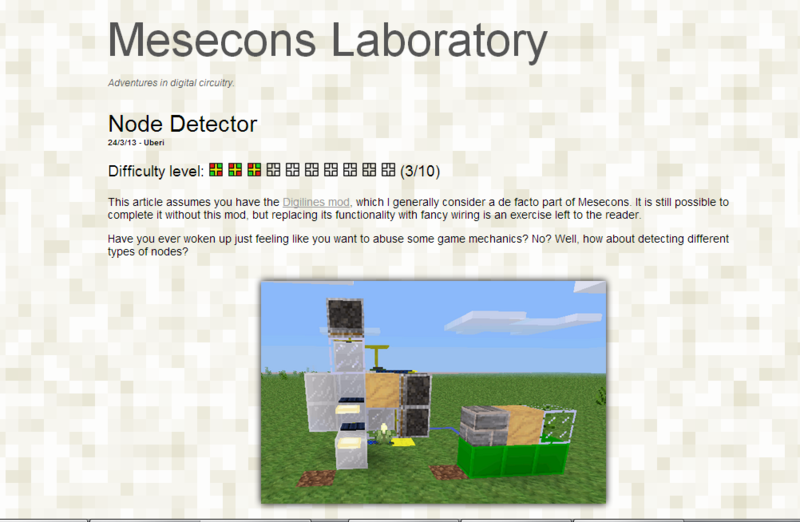 Have you tried the WorldEdit schematic? You might also want to make sure your Luacontrollers are facing the correct direction. Generally, you can tell which direction I'm building it from the pictures. In the digital clock article, port A should be facing the lightstone, and port C should be facing the back. If you built it another way, don't fret! Simply replace things like port.a in the code with the correct port, and continue building. Alternatively, use WorldEdit's //rotate command to rotate your entire structure to the desired orientation. I also added the //orient command a while back, so if you used facedir nodes in your build you can use this to rotate individual nodes like furnaces and delayers. I'll add notes to all existing and future articles to clarify this point. Last edited by Temperest on Mon Apr 15, 2013 21:37, edited 1 time in total. Note how the second-from-bottom row is working but the bottom isn't. This is with the code from the website. This segment is supposed to be displaying "7". Oh, I see the problem. If you look carefully in the image, I used uninsulated mesecon in the second-to-bottom and second-to-top row rather than insulated corner wires. This differs in that the rows above and below it also light up when this one does. Last edited by Temperest on Tue Apr 16, 2013 23:05, edited 1 time in total. Thanks - it works fine now. It goes quite well with another work of mine, the "Opinionated Guide to Advanced Mesecons". Check it out! The rate of articles being published will decrease a bit while internet access is sporadic. Last edited by Temperest on Wed May 08, 2013 23:15, edited 1 time in total.